Is Saul “Canelo” Alvarez the next Oscar De La Hoya? Nope. According to Saul's promoter, De La Hoya himself, Saul is the first Canelo and not the next De La Hoya. In a recent interview conducted by John Whisler of the San Antonio Express, De La Hoya was asked if Alvarez is going to be the next Oscar De La Hoya? 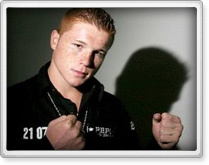 De La Hoya tells the publication: "He's going to be the first Canelo. I mean there's only one Oscar. Canelo is going to make his own mark. When I go with him to Mexico, the fan frenzy he creates is amazing. The last time I went with him, I said to myself, ‘He's the future, I'm the past.' What other Mexican redhead do you know that can fight like that, and at 20 years old? That's why the fans love him. He looks like Howdy Doody, and he can fight."